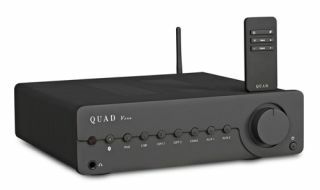 Quad Vena amp/DAC makes its world debut at Bristol Show 2014 | What Hi-Fi? Making its world debut at the Bristol Sound & Vision Show this weekend is the Quad Vena amp with integrated DAC (digital-to-analogue converter). It will be available from May at an expected price of around £600. The digital-to-analogue conversion is handled using the same 24-bit/192kHz chipset used in Quad's Platinum CD players. The amp also incorporates wireless aptX Bluetooth capability for streaming music from compatible devices. The Class A/B amp delivers a claimed 45W per channel into 8ohms. It is designed to deliver "superb sound from smartphones, tablets, PCs and Macs, as well as traditional hi-fi separates", says Quad. It will be available in three finishes: piano black, piano white and wood veneer. Also on display at Bristol a Quad's new 9AS active speakers and the Vista 100 Bluetooth soundbar from sister company Wharfedale, costing £150.